San Fulgencio is a small town approximately twenty-five kilometers south of Alicante and just to the north of Rojales. There are two choices of airports to fly into which are Alicante and Murcia, both a mere twenty minutes by car to San Fulgencio. Once at the airport you have a range of different airport transfer options to San Fulgencio including private shuttle buses, taxis or San Fulgencio car hire. There is a local bus service which operates from Elche to Guardamar, and comes through La Marina urbanisation. Not being directly in a seaside resort can be an advantage if you are seeking a quieter holiday as you have the best of both worlds just a few minutes away. The Fincas De La Vega Urbanisation or La Escuera Urbanisation are good places to stay if you have hired a villa as you have all the amenities nearby. The Bar Restaurant Partyda is local to La Escuera so you don’t have to venture much away from your accommodation. At the Bar Restaurant El Horreo you can enjoy dining and dancing every Friday and Saturday as well as their €10 Menu. Try the La Estación – Gastrobar for friendly and family ambiance, home made simple food, good quality and prices. Breakfasts – Foods – Drinks – Entertainment and Music. Address: C.C. Monte Victoria, c/Alfredo Kraus, 2 – Frente al Centro de Salud Urbanización La Marina San Fulgencio. Telephone: +34 865 777 255. One of the traditional villages of the Vega Baja district of the Costa Blanca, San Fulgencio began life during the early 18th century when it was built on reclaimed land, taken from the marshes of the River Segura. Surviving on agriculture since these early times, it has become popular as a tourist destination with many holiday homes being built nearby on the ever growing La Marina urbanization. The village centre still has the look of the typical Spanish village of the region, with a tree shaded village square bounded by its town hall and parochial church. While San Fulgencio is an inland village, it is quite close to local beaches such as Guardamar del Segura and La Marina, and attracts tourist who want a bit of peace and quiet while still being able to access the busy beach areas. Whatever time of year you choose to visit San Fulgencio you will almost always have good weather if you like hot summer, mild winters and warm autumns and springs. The town has a very good infrastructure with all the amenities you can expect from a traditional small Spanish town. It has banks, supermarkets, and plenty of restaurants. The nearest beach is a five kilometre drive away by car with a few facilities including a picnic area in the pine forest adjacent to the beach and a bar and restaurant on the beach. More services are to be found in the nearby urbanisation of La Marina, or the nearest towns which include Guardamar and Santa Pola a ten kilometre drive away. The castle and the two beautiful public parks of Guardamar as well as the promenade of Santa Pola are well worth a visit. Below we have an interactive guide and map of San Fulgencio for visitors and tourists visiting the small town of San Fulgencio which is located approximately twenty-five kilometers south of Alicante and just to the north of Rojales. What is the nearest airport to San Fulgencio? How do I get to San Fulgencio? Where can I find driving directions to San Fulgencio? Where can I find a free streetmap of San Fulgencio? Using the buttons on the top left you can ‘zoom’ and ‘pan’ and take an interactive virtual tour of San Fulgencio watching the panoramic images and pictures of the sights and attractions of San Fulgencio. You can also choose the point you want to have in the centre of the map by double clicking. This interactive Google San Fulgencio map and guide is best used as a tourist information guide as it shows some of the best sights, attractions, tourist spots, famous landmarks and places of interest in San Fulgencio. Opening Hours: Monday to Friday, from 09:00 to 15:00 h. Saturdays from 9:00 to 14:00 h.
Use the San Fulgencio car hire price comparison website tool below to quickly find the cheapest car hire for San Fulgencio in Spain in just seconds. The free price comparison search engine below will compare all the current San Fulgencio deals and rates to give you the lowest price for renting a car in San Fulgencio. The price comparison tool will compare all the latest San Fulgencio car hire quotes and prices and car rental rates between the major international brand name car hire companies as well as national and local Spanish car hire companies saving you both time and money. It is free to use – just put in your dates for your car hire San Fulgencio and tell us what type and size of car you want to hire – then let the price comparison booking engine do the rest! Will I be able to hire a car locally in San Fulgencio? We also have help and information to those people who are looking for San Fulgencio property or San Fulgencio properties. There are lots of properties for sale in San Fulgencio mostly San Fulgencio apartments and San Fulgencio villas. Whether you’re looking for a place to rent or to stay at permanently, you can take advantage of the services from the real estate agents in San Fulgencio who are more than willing to help you in finding your ideal residence. You can contact Marina Properties (marinaproperties.es, Tel. +34 865 777 290); Nelemans Real Estate (www.nelemans-realestate.com, Tel. +34 966 792 288 and +34 627 608 361) and Su Casita International (www.sucasita.eu, Tel. +34 966 790 012). Dave, what would you say would be the advantages to living in San Fulgencio compared to other Costa Blanca towns? San Fulgencio is situated between the salt lakes of Santa Pola and Torrevieja, and has been declared as one of the healthiest areas to live in according to the World Health Organisation. The urbanisation of La Marina is just 4 km to the beach, and surrounded by traditional Spanish towns, La Marina village, La Hoya, Dolores, San Fulgencio village, and Rojales. There are none. The urbanisation offers close knit communities with a large spread of nationalities, the local towns have a traditional Spanish life style, and the rural areas between the towns offer a quieter way of life but within a few minutes to the amenities. 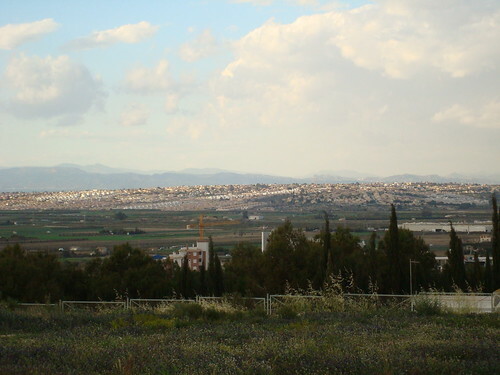 The surrounding towns are populated mainly with Spanish people. The urbanisation has a wide mix of nationalities: British, German, Belgium, Dutch, Scandinavian, and Spanish. What are your favorite things to do in the area? The area offers a full range of sporting activities, Golf, Fishing, sea and fresh water, Cycling, Mountain walks, Aqua parks, Cinemas, large shopping centres in Elche, Torrevieja, and La Zenia Boulevard. The beach is within a few minutes from all the above mentioned towns. There are bars and restaurants to cover all taste, Sports bars offering live action sports, Entertainment bars offering Karaoke, Disco, Live acts, traditional Spanish bars offering Tapas, and some offering the chance to chill and have a quick chat. Restaurants to suit all taste, Chinese, Indian, Spanish, French, Traditional British, and Scandinavian. There are Health centres, dentist, Chiropodist, and Ophthalmic centers in the area. The larger hospitals of Elche and Torrevieja are approx.. 15 minutes by car. These are mentioned above. They offer all the amenities such as local shops, banks, supermarkets, and weekly local markets. The urbanisation also offers a market three times a week. There are International schools in Elche and Torrevieja. Plenty of local schools are found in the surrounding towns. There is very little crime, and with at least five free English speaking papers per week I think we are kept well informed of any events. Resale property prices are quite firm and will start to rise slowly after about seven years of decline. New build properties are in high demand and increasing much faster. Now is a good time as properties will increase in value. All the best bargains have been sold. There are still some cheap resale properties, but they would need some upgrade. La Marina is mentioned above. This is a large urbanisation which offers every amenity. There are four commercial zones, so all properties are within a short walk to their nearest zone. How much are the typical property prices in San Fulgencio for apartments, villas etc? A two bedroom Bungalow / Townhouse will start at around 50k. A two bedroom Apartment / Duplex will start around 70k. Any tips and advice to people looking to buy in San Fulgencio or surrounding area? Visit Su Casita, with 20 years trading and experience we offer a complete professional and honest service. Dave, thank you so much for taking the time to help our readers with your experiences in Spain. If you want to contact him, you can find his details below. The local tourist office offers a service where they can help you find accommodation in San Fulgencio. There are San Fulgencio hotels, pensions, apart-hotels and hostels. San Fulgencio Page Summary – This page contains useful San Fulgencio information for people intending to visit or holiday in San Fulgencio. In this tourist guide to San Fulgencio we help visitors who are planning a trip with useful and practical advice on many tourism related subjects such as San Fulgencio car hire, San Fulgencio accommodation, sightseeing, weather, where to go, where to stay, travel information, excursions and what to see and do in and around San Fulgencio. We also have photos, picture galleries, views, videos and San Fulgencio webcams so you can see what San Fulgencio has to offer you for your San Fulgencio holiday.